Last Sunday was our first Sunday School morning for the new school year. I am doing a bit more volunteering with the youth programs this year and it turned out to be a busy morning trying to get everyone situated. We have a very small parish … that tends to happen in a very small town, but there were still lots a little things to do. Because it was the first Sunday a volunteer brought in some muffins and juice. I managed to lose my juice that morning. I am pretty talented as you know, but how difficult must it have been to lose a cup of juice in a church basement? I didn’t think too much about it until the following Wednesday. Last Wednesday was our first junior and senior high class night and again I was there volunteering my time to get things off to a good start … or at least a start. I was making a poster for the night which the kids were going to sign and I needed a pencil. I went to the somewhat disorganized (on the to-do list) cupboard and found a handful of pencils of pencils in a cup and grabbed one. It was wet and I thought “gross!” and wiped it off and shut the door and walked away. In mid step a few feet away I stopped and thought “ok that was odd … I should probably find out WHY exactly this pencil was wet” and sure enough … I found my juice! At least it was put to good work as a handy holder for some random pencils. I brought the camera to take some shots of the night … unfortunately I forgot all about taking pictures of the kids … but I have proof of the missing, yet found cup of juice. I have moments like this all day long, but rarely I have proof with a picture to go with the story … just thought that you would get a kick out of “just an everyday goofy moment in the life of Poofergirl”. « Just a towel … but it makes me smile. The more I think about this, the more it makes me laugh! 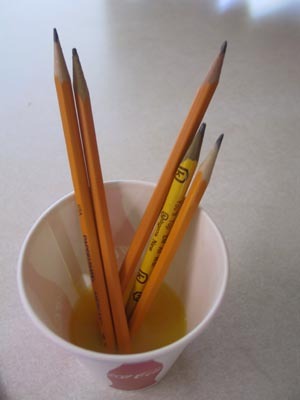 The real question is, who was the nut who thought it was a good idea to stick a bunch of pencils into a cup that had juice in it?! Funny! I have to confess I entertained thoughts that YOU may have put the pencils in the cup. Not that I think you’re absent-minded at all. Maybe because you said you have moments like this all day long.